They say necessity is the mother of invention. Have you ever been right in the middle of a project, when you realize that you could hack up a simple tool which would make your current task easier? Maybe it’s a coil winder, or a device to hold .100 headers straight in their holes. Faster than you can say “Arabian Nights”, you’re working on a project within a project. It might not be pretty, but it gets the job done. This week’s Hacklet is all about quick tool hacks – little projects that help out around the shop or hackerspace. We start with [theonetruestickman] and Magnificent Magnifier LED Coversion. [theonetruestickman] picked up an articulated magnifier lamp at Goodwill for $4. These lamps are a staple of benches everywhere. The only problem was the switch and fluorescent tube were both failing. [theonetruestickman] didn’t feel bad for the lamp though. He pulled out the tube, ballast, and starter, replacing them with LEDs. 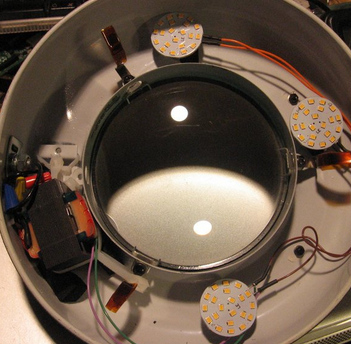 He used 12 V 3 watt LED modules to replace the tube. Three modules provided plenty of light. An old wall wart donated its transformer to the effort. Since these LED modules are happy running on AC, no bridge rectifier was necessary. The modernized lamp is now happily serving on [theonetruestickman’s] workbench. Next up is [Kwisatz] with Pick Up tool hack. [Kwisatz] is a person of few words. This whole project consists of just two words. Specifically, “syringe” and “spring”. Thankfully [Kwisatz] has provided several pictures to show us exactly what they’ve created. If you’ve ever used one of those cheap pickup tools from China, you know [Kwisatz’s] pain. The tiny piece of surgical tube inside the tool creates a feeble vacuum. These tools only hold parts for a few seconds before the vacuum decays enough to drop the part. [Kwisatz] kept the tip of the tool, but replaced the body with a syringe. A spring is used to create just the right amount of vacuum to hold parts on while they are being placed. [Dylan Bleier] made his shop air a bit safer to breathe with a simple fume extractor for $20. Solder and flux create some nasty smoke when heated. Generally that smoke wafts directly into the face of the hacker peeking at the 0402 resistor they are trying to solder. A bit of smoke once in a while might not be so bad, but over the years, the effects add up. [Dylan] used two 120V AC bathroom fans, some metal ducting, plywood, and a bit of time to make this fume extractor. [Dylan] is the first to say it’s not UL, CE, or ROHS compliant, but it does get the job done. He even added a screen to keep bugs from flying in from the outdoor exhaust port. [ftregan] needed to wind a helical coil for an antenna, so he built Helix Winder. Helices are essentially springs, so that should be easy, right? Turns out that making a nice uniform helix is not the easiest thing in the world. The helix winder is a jig which makes winding these special coils much easier. Holes are drilled at a specific angle in a wooden block. The wire is fed through that block and rolled onto an aluminum tube. Rotating the block on the tube forces the wire into the helix shape. The only downside is that each winder is only good for once dimension of helix. I’ve noticed that some of these quick hacks don’t get as much love as they deserve over on hackaday.io. So if you notice a cool hack like this, drop a comment and give the project a skull. If you want to see more of these hacks, check out our new quick tool hacks list! See a project I might have missed? Don’t be shy, just drop me a message on Hackaday.io. That’s it for this week’s Hacklet, As always, see you next week. Same hack time, same hack channel, bringing you the best of Hackaday.io! Yes, changing a lightbulb is such a hack, I’m impressed! Wouldn’t like to see flickering light for closeup work. What is wrong with DC and no flicker. what if the LED modules are set with polarities opposite each other, they would still be flickering, but one would light up during the half cycle the other is reverse biased, the flickering would be 120 Hz, not 60 Hz. If that’s your major light source, it’s still going to be annoying. LED flickering isn’t like fluorescent tube or CRT flickering because it goes completely black at zero crossing with no afterglow. With that sort of complete on/off pulsation, human vision can percieve up to 2 kHz at the periphery. Not too sure about white LED as they are using phosphors from blue LED… The yellow stuff is the phosphors. Another quick tool hack, Dont have a lathe? need to make a piece of aluminum a smaller diameter? Chuck it in a hand drill and use a file to make it a smaller diameter. use a rough file to get it close, then a fine file and then 800 grit sandpaper to get it smooth again. It’s not fast, but it’s a lot faster than going out and buying a lathe, setting it up, and doing the same thing, and a whole lot cheaper. Look up Fonly Lathe. “If only I had a lathe”. HaD could do a series on homebrew metal and wood lathes. The ‘Fonly Lathe is extremely cool. I’ve built a couple of one-off jigs to do some of the same things, but I used a drill press rather than a hand drill. Going to have to bookmark that…. I needed to extract a broken off machine screw from a cross slide on a metal lathe. Didn’t have the right size extractor and I didn’t want to go poking about in the hole with a drill and damaging the threads. So I took a small end mill that was broken off, chucked it in a 1/2″ electric drill and ran it against a bench grinder to point it. Next I flattened the end with the grinder, then finished by cutting two grooves in an X across the end. Held the former end mill hard against the end of the broken screw, put the drill in Reverse and pulled the trigger. The sharp edges on the hard tool bit in and spun the screw out. My favorite utility hack: When I build a board with SMD parts, it seems half of the resistors and chips end up upside down when I peel them off the paper carrier or spill them out of the tube. After I have placed the right side up parts, I press the sticky part of a post-it note down over the remaining parts and turn the post-it note over and then pick them [now right side up] off with tweezers [fine point curved, anti-magnetic because many parts leads are magnetic]. That’s a good idea. I usually just end up picking them up and dropping them with the tweezers until the part lands right side up. You could butter the top side to make them more likely to land right side up! A highlighter or marker works very well for marking SMT parts e.g resistors, caps on a board. e.g. parts you want to desolder, swap or measure. Instead of a fan for the fume extractor, you can use the power of ions!